Growing up in Vancouver, I had very little exposure to Mexican (or even pseudo-Mexican style) food. About the closest we came was the Taco Time chain at Metrotown Mall. We had leftover ground beef that we bought for our meatloaf the other night, so David suggested we do tacos. After a bit of poking around, I settled on a recipe I found on the Food Network’s site by Emeril Lagasse, which seemed straightforward and involved ingredients that we already had. In a sauté pan, heat olive oil. Add onions and sauté until translucent, then add garlic and cumin and sauté until fragrant. Add beef to the pan and cook, breaking up the pieces, until the meat is browned. Season with cayenne pepper and salt. Add broth and tomato paste and bring to a simmer. Cook meat, stirring occasionally until most of the liquid has evaporated. 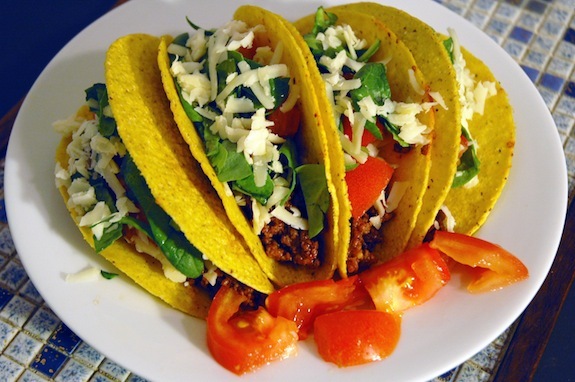 Remove from heat and assemble tacos to taste. I was pleasantly surprised at how much I enjoyed this dish. Mind you, I would probably enjoy most things with grated cheese and sour cream on top. But I enjoyed the combination of creamy, cool sour cream against the (mild) spiciness of the beef. We had leftover avocado dip from our tortilla chicken dish, which went well as a guacamole substitute. This dish certainly recalled David’s youth (some fond nostalgia was had, as apparently he’d had many a taco when he was younger). A fun dish, all in all.